Big problem here is adoption. Quick charge times are great, but I'd much rather have a battery that will last the day and charge it overnight than one I need to remember to charge multiple times as I go about my day. Sure, it'll improve over time, but so will other batteries, and I don't see a preference for high capacity going anywhere unless battery life in general gains a big lead over power consumption. What I would like to see is some hybrid battery setups. In other words, maybe 80% of my battery capacity is in the old stuff, charging slowly but giving me longer life, while the remaining 20% is in the new stuff and is consumed first, allowing an overall similar battery life, but allowing a 20% charge within a matter of seconds when I need a quick boost. It's worth noting that they expect the battery life to be identical or better by the time they put it into full scale production. The 900mAH version is really just the proof-of-concept. To be honest I think many people would be willing to purchase a phone that requires multiple charges anyway. It's not ideal or necessarily possible for all users, but I know I'm never away from a charging cable more than a couple hours at a time anyway. Well the battery in my HTC will last a whole day of browsing and messaging with around 5-6 hours playing music constantly, plus the odd bit of video streaming on a full charge. The only things that kill the battery life are games and constant streaming. The battery takes about an hour to fully charge (it is less than a year old though) which means I tend to charge it once in the morning and give it a top up in the afternoon, just in case. I still miss the old days of my Sony Ericsson walkman phone. That thing could hold a charge for over a week. As for this new stuff; if they can get the capacity and endurance up to current standards by 2017, then hell, I'll bite. But if it remains closer to its current state, then I'll pass because I just don't see the benefit. This tech might be great for things like radios and handheld equipment, where constant use requires charging and battery swapping often anyway. But it might take jumping some hurdles to get it into basic cell phone adoption. Forty amps means the cable and the charger will be pretty big. No USB port is going to deliver that juice, either, and the adoption of micro USB 2.0 or 3.0 on almost *shoots the bird in the general direction of Cupertino, CA* every model smartphone will make it hard for some to choose to go back to solely relying on power bricks. Or just buy two batteries, charge time becomes as fast as you can swap those. Also a bulky battery that charges extremely fast with little storage capacity already exists, we know them as capacitors. I'd rather have slow charging batteries that last long. It's battery tech catching up to what already is, personally I'd like to see a Plutonium battery that last a lifetime so I won't need cables anymore before a smartphone on my manhood that's high hipster fashion. The same can be said for most of the tech you own, bud. So if im reading this right, all they did was made a stronger current charger without changing the batteries themselves? oh boy is this going to backfire once their batteries start dieing. 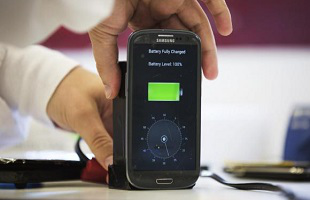 you can overcharge your smartphone batteries too. and if you do it smartly you too can make it charge in minutes. expect to need replacement in a month though because it kills the battery. and from what i see here this is not much more than that. To be honest I think many people would be willing to purchase a phone that requires multiple charges anyway. It's not ideal or necessarily possible for all users, but I know I'm never away from a charging cable more than a couple hours at a time anyway. im horrified of what you said. its bad enough i see people charging phones daily. what the hell? I charge my phone once a week and it never dies on me. i would never buy a phone with battery so small i need to charge it daily. heck, id pay good money if they could double my battery capacity even if that means doubling the size of phone. alas - no such models exist. not going to work unless you can swap them faster than your phone realizes you pulled the battery out. otherwise you need to shut it down. So if im reading this right, all they did was made a stronger current charger without changing the batteries themselves? oh boy is this going to backfire once their batteries start dieing. uses "specially synthesized organic molecules" to move that current between the anode and cathode at a higher speed than traditional batteries. im sorry but using buzzwords is not equivalent to scientific discovery. ALso it does not matter what organic molecules they are using, if the batteries are still based, as most of phone batteries are, on Lithium-ion. While this is great, what I really care about is longevity of the battery. I have no problem charging my phone overnight and while this sure would be convenient it's not much more to me than a novelty without battery life to back it up. 40 amps? That's insane. That has got to be a mistake. That is way more than the most power hungry electrical household appliance. Things that typically fall into the 30 amp range are: electric dryers, electric stoves, and electric ovens. I don't even think central AC units use 40 amps. If its not a mistake, this has got to be the most power inefficient method of energy transfer in human history. And I'm including the campfire in that estimation.